made with a 3-lens turret. 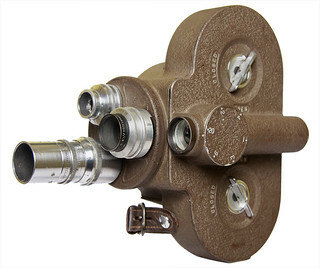 Bell and Howell is an American manufacturer best known in the past for motion-picture equipment. The company was started by Donald J. Bell, a projectionist, and Albert S. Howell, who worked for a maker of film projectors. The two patented a design for a cine projector in 1907. Their first camera, a wooden cine camera, was made in 1910. 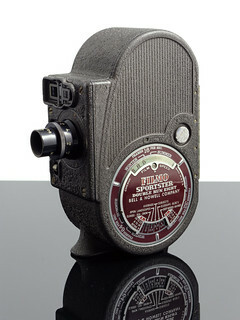 The company's early products were very successful, and they made most of the cameras used in Hollywood for a while; however, Bell and Howell fell out, and Howell and an associate bought out Bell's share in the firm. 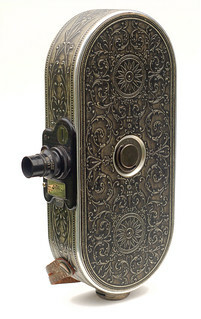 Later, the company became one of the well-known makers of amateur cine equipment, as shown here. Bell and Howell made only a few notable still cameras. 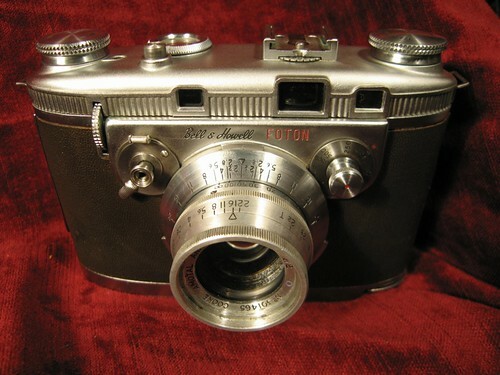 Of these, perhaps the most impressive is the Foton from 1948, a coupled-rangefinder camera with a spring motor advance allowing continuous exposures at 6 frames per second. Some of B&H's cameras came about by company acquisitions; B&H bought the Three Dimension Company, which made stereoscopic cameras and equipment, and retained the TDC brand for the Stereo Colorist and Stereo Colorist II and the Stereo Vivid. In the 1960s, some Canon cameras (including at least the FX, Demi, Canon Dial 35 and some of the Canonet series) were marketed in the USA by B&H, some with and some without Canon's branding as well. B&H stopped making professional and amateur cine cameras in the early 1970s, and concentrated on other businesses, including mechanised mail-sorting equipment and microfilm. The company was subsequently involved in a large number of acquisitions and sell-offs. A number of cheap cameras exist from the 1990s with the B&H brand. 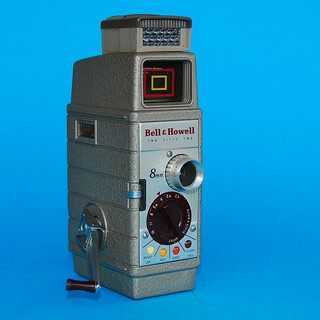 The Bell and Howell brand is now (as at June 2012) owned by the holding company BHH LLC (completely separate from Bell and Howell, LLC) and is applied to a wide range of products, including some compact digital cameras. ↑ There are many Filmo 70 models with different features, from the mid-1920s to the mid-50s; another Filmo 70, in the CW Flickr Pool, has a turret viewfinder too, geared to the lens turret. Some can connect to an external motor drive. ↑ US Patent 862559, Picture-exhibiting machine, filed in 1906 and granted 1907, at Espacenet, the patent search facility of the European Patent Office. The patent, which describes various improvements to a film projector, names Howell as the inventor, but Bell (not 'Bell & Howell') is the assignee; perhaps the company did not yet exist (Patent 1056794, Photographic-printing apparatus, filed 1909 and granted 1913, describing a machine to make the positive prints of cine films, names Howell as the inventor and the company as assignee). ↑ 3.0 3.1 Gale Directory of Company Histories, 2006, Gale Group Inc.
↑ McKeown shows a Dial 35 marked only for B&H; McKeown, James M. and Joan C. McKeown's Price Guide to Antique and Classic Cameras, 12th Edition, 2005-2006. USA, Centennial Photo Service, 2004. ISBN 0-931838-40-1 (hardcover). ISBN 0-931838-41-X (softcover). p123. ↑ Bell and Howell, LLC is still (after a relaunch) in this business; see the company website (retrieved 28 May 2014). ↑ B&H website (archived 30 May 2014, needs Flash Player). This page was last edited on 8 November 2018, at 06:20.